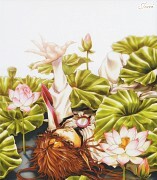 Tagged under Kazuya Minekura, Drama CD, Series. "Can you be someone's sun?" 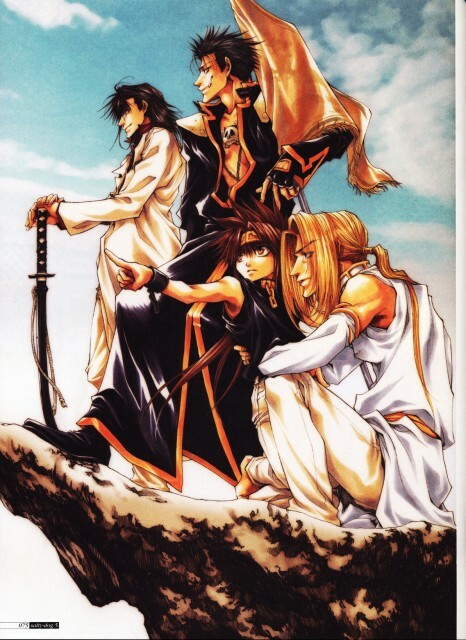 Five-hundred years prior to the original Saiyuki, Reload, & Blast story line, there was "Gaiden", were a nameless heretic child was brought to Heaven on fear that if left alone, chaos would befall the gods. The Merciful Goddess Kanzeon Bosatsu, orders her nephew Konzen Douji to care for the child. Though reluctant at first, Konzen slowly warms up to the child as he watches him become friends with Tenpou Gensui & Kenren Taishou. The heretic child would also start a friendship with a boy that also seemed his age: the War Prince Nataku. ...That heretic child was named "Goku". This is the story of the former lives of Genjyo Sanzo (Konzen), Cho Hakkai (Tenpou), and Gojyo (Kenren) when they were gods in heaven, how Goku was brought there and what ultimately led to their fallout from heaven and Goku's 500 year imprisonment prior to being found by Genjyo Sanzo in the main story. A tearjerker OVA detailing Goku's time with the previous incarnations of his comrades up in the heavens, a good tie-in to the first Saiyuki series as it goes into the final days Goku has up in the heavens with Konzen, Kenren, and Tenpou as the four are deemed as rebels and criminals. However, I think it could've been made as a movie and animated by Pierrot, as well as have better music, plus remake the beginning story of Goku's life in the heavens as the TV series version of those events included anime-only characters Homura, Zenon, and Shien. I'm happy that Sentai is dubbing it with the original voice cast and I hope they consider re-dubbing Reload and Gunlock.